Stewardship today for a sustainable tomorrow. Welcome to the FAAST Initiative! FAAST provides farmed animal owners and their veterinarians with the news, tools, and resources they need to help prevent antimicrobial resistance, a global threat to human and animal health. FAAST is a collaborative initiative between the Ontario Veterinary Medical Association, government, academic, and industry partners. 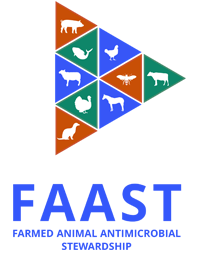 FAAST aims to improve antimicrobial stewardship in food animals, prepare farmed animal owners and their veterinarians for upcoming policy and regulatory changes, and preserve the efficacy of antimicrobials without compromising animal health or food safety. Have questions, comments, or feedback for the FAAST team?